My epic job search took me to Zappos in Henderson, Nevada. A visit to their website shows that the company is doing good things. You get the impression Zappos is a good place to work, even if they are a bit pretentious about being "weird" (see below). A video shows the typical wacky antics that go on. It's like their motto is "Working really hard at being silly." They actually responded to my application, which clearly stated that I haven't had a job in over two years. That alone should kill my chances with any self-respecting company. Did they somehow miss this? What obscure tidbit in my record had Zappos noticed that other HR screeners had failed to see? As beleaguered job-seekers understand, any flicker of interest from an employer is miraculous. I was invited to take their test for the Customer Loyalty Team. While I waited in the reception area, a group of merry-makers barged in and played hula hoops with the receptionist. A stack of hula hoops rests by the reception desk for just this purpose. The receptionist dialed in some cool tunes on her boombox. A camera-wielding staffer shot the episode for the company archive. I stood to one side. While this was going on, the Zappos recruiter came to the reception area to fetch me. "How come you didn't participate in our little hula hoop game?" "Er, I'm just a visitor, I didn't think...."
"Some of those people were visitors too!" Ouch. I had already missed a golden opportunity to establish my silliness credentials. I may have doomed my chances right there. 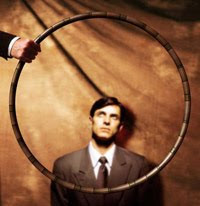 I sensed Jared the recruiter registering a sour mental note: hula hoop hater. Had I played hula hoops, I might have landed the job. "We'll waive the tests! You're our guy!" I might have skipped the typing, grammar, and data entry tests, plus two interviews. While I waited for Jared to review my test scores, I mentioned that I'd love to see the Hunter S. Thompson room. A frisky young woman jumped up from her desk and showed me the way. All of the rooms throughout the facility are named to show how cool & hip Zappos is. Walking to the room, the cheerful employee noted that she'd never heard of Hunter S. Thompson until she worked at Zappos. "I had no idea he was a Vegas icon." "Icon" is a very cool word these days. No, she hadn't read anything of his, nor had she seen the movie starring Johnny Depp. The room was decorated with Steadman-like* scenes painted on the walls (strictly by multi-talented employees of course). The miracles continued. I passed the tests, even though I only finished five of the six data entry problems. I was invited back for an interview. I was a little concerned that they wouldn't want an old guy (I'm 61). "Elderly" folks are conspicuously absent from the group photos and videos on their site. Yes, being around old folks is a serious buzzkill for the younger set. It seems unlikely, however, that a company that prides itself on diversity would actively discriminate. Besides, it was up to me to show how cool & hip I could be (without putting on an act). Their slogan is "Build a Positive Team and Family Spirit." Well, what's a family without a grandpa? Jared convened our interview in the Beatles room. Beatles posters and memorabilia were tastefully displayed. "Tell me about a time you had to think outside the box to solve a problem," he began. Jared got a charge out of that. "I'm going to use that," he said. 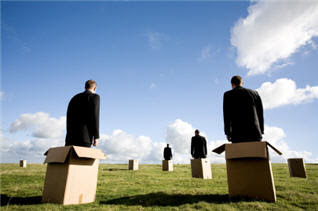 I hoped Jared would appreciate that I'm too hip to say "think outside the box," which puts you hopelessly in the box. To show that my thinking sometimes drifts out of the shoebox, I brought old shoes to my interview. Wasn't I the first guy to drag an old pair of sneakers out of his Barnes & Noble bag during an interview? I used them as props to recount my experience trying to find a replacement pair with Zappos. Jared asked why I wanted a job at Zappos. I'm making a fresh start, I told him. "My job in home building is not coming back," I said. His eyes went wide. ** He looked at me as though I were quoting Chaos Theory. Major mistake. Never say anything downbeat in a job interview. Answer every question like a contestant in a beauty pageant. "Well, at least not in the near future," I allowed, hoping to clean it up some. To his credit, Jared went easy on me when it came to the subject of what I had been doing for two years since my last job. You looked for work for two years and came up empty? What kind of pathetic loser are you? Jared was gracious enough to chat with me a few minutes. He could easily have given me the bum's rush, escorted me out with a few brusque remarks. I'm pretty sure his mind was made up in the initial seconds, if not before. He was probably thinking, "Who goofed! Our screening process needs to be revamped." When Jared and I parted, I told him of my plans to fling my old sneakers on the Amboy Shoe Tree my next trip south. I briefly filled him in on the desert outpost of Amboy along old Route 66 and the tree decorated with scores of cast-off shoes. His brow furrowed, Jared nodded politely as if humoring a mental patient. He clearly had no interest in Amboy or anything so weird as a shoe tree. The second interview--in the Rat Pack room--was with James, a Customer Loyalty Team supervisor practically young enough to be my grandson. The conference table was painted to look like a pool table. James admitted upfront that he normally doesn't do interviews. He was hurriedly pressed into service because the regular interviewer wasn't available. In hindsight, that was a big red flag. Jared probably told the regular interviewer that I was damaged goods. "James! You need experience interviewing. Go talk to this guy." I left with Jared saying he would let me know on Tuesday. I never heard from him. I emailed Cheri, the charming HR person, asking for an update. Suddenly there was no charm available for me. No reply. I was such a horrible applicant that they weren't going to dignify my interest with a response. I'm an insult to everything Zappos holds dear. Not just no, but HELL NO! Job interviews are great for highlighting your shortcomings. From my perspective, I'm handling the interview in a workmanlike manner, not disgracing myself. Jared may not be bowled over, but I think I'm making a reasonably good impression. Meanwhile, Jared is inwardly recoiling in disgust. I certainly need better salesmanship. An emphatic rejection from a company like Zappos can be more bruising than the typical rejection based on poor salesmanship or various deficiencies in your employment history. You might be eminently qualified but the recruiter may detect telltale signs that you are not cool, hip, or weird enough. It might remind you of your school days when you got snubbed by the popularity clique. *Ralph Steadman the artist, not Oprah's boyfriend Stedman. **Jared's startled look told me the Great Recession had no direct impact on him. If your job is safe and secure, if you haven't lost your home or had your pay cut, the recession is like the swine flu, a nebulous phenomenon not likely to touch your life. "Jobs not coming back" sounds alarmist, something a crackpot might say. We're now a bifurcated culture, with half of us mired in the recession's devastation while the other half bebops through life wondering what all the fuss is about. So here's what all the fuss is about. Since December '07, the economy has lost EIGHT MILLION jobs. What hallucinogen would make guys like Jared think all those jobs are coming back? Not in a decade. Not ever. An upside: I was invited to grab a book from the shelf in the reception area. There is a nice selection of trendy entrepreneurial books. I took Malcom Gladwell's latest, Outliers. Gladwell is brilliant. Zappos culture: Zappos has ten core values, including #3 "Create Fun and a Little Weirdness." At an ordinary company, employees may have to downplay their weirdness. At Zappos, they get to flaunt it. In fact, it's required. Closet squares need to downplay their tendencies. God forbid you grow weary of hula hoops. You might get reported to HR. They probably have spies who look around the room to make sure everyone is singing when a birthday cake is presented. It's not unusual for companies to design their culture. UPS, for example, is known to have a straight-laced culture. I'd take Zappos any day, but that doesn't mean I'd be miserable at UPS. When it comes to making a living, some of us can adapt. Possibly the best job in my life was working for Great American Life in Los Angeles. Their culture had no identifiable design. Not only did they welcome the weird, GALIC welcomed every race, creed, color, class, ethnicity, religion, national origin, sexual orientation, gender, shape, size, and age group. They also welcomed ordinary everyday people who weren't noticeably edgy, hip, or cool. It's fun and rewarding to work in that kind of atmosphere. Hula hoops were optional. 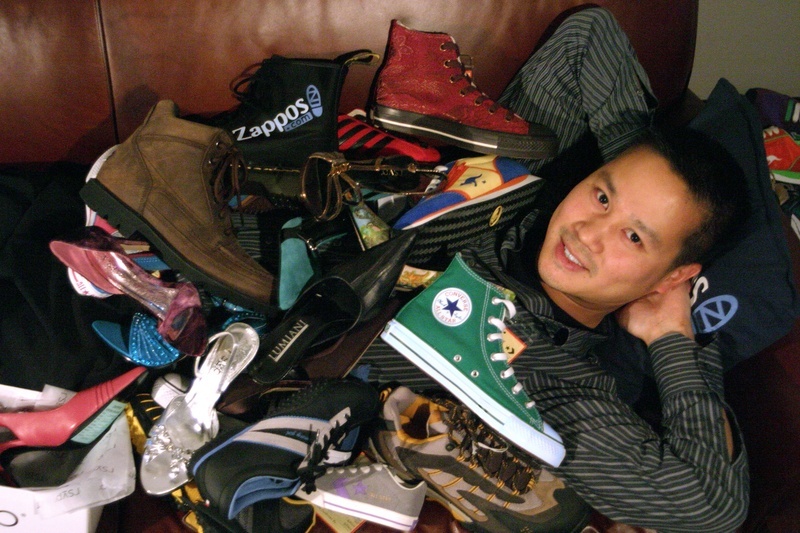 Tony Hsieh, Zappos leader and merchandising wunderkind. No replies to this and I, 2 years later or so, am just now commenting on how great your writing here is? I found you through Amazon.com and your review on a 2005 book on book selling. I also had a soiree at selling books.. first my own in the beginning, and then scouting for a few years, etc. I would be interestd to talk with you more. Take it easy "old codger"
Chris - critic, cynic, and conspiracy "theorist"